One of the easiest and most useful gardens to grow is the kitchen herb garden. Herbs are easy to maintain and can grow well in small areas. There are many herbs that do well in an indoor setting, and you don’t need any special lights! Herbs will do just fine in a brightly lit window. 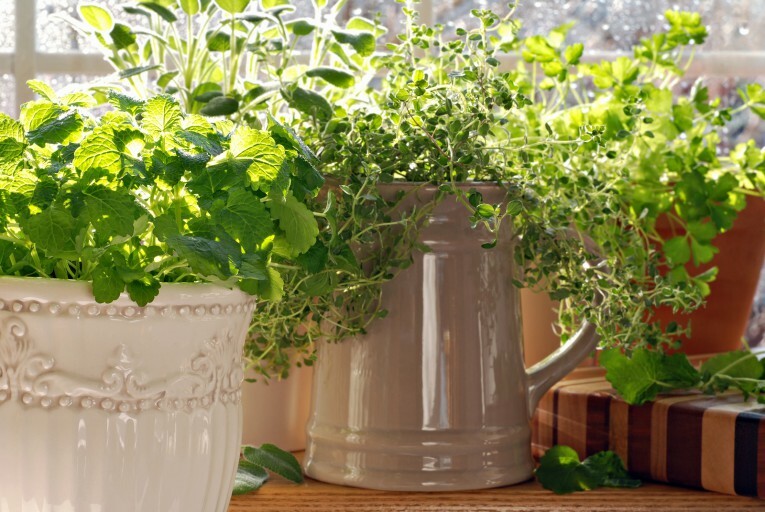 Growing herbs indoors is a great way to enjoy that fresh just-picked taste year round. According to garden writer, Kris Wetherbee, it is easier to start with healthy plants as opposed to seeds. Starting with a plant will start you months ahead compared to starting from seeds. They will need a bright space, like a sunny window, a room with skylights, or a sunroom. The room temperature should have good air circulation and be between 55 and 75 degrees. Most herbs used for culinary purposes grow best with around five to six hours of bright light. When choosing your location keep nearby trees, a patio, or roof overhangs in mind so that your herbs are not covered in too much shade. You can use any container that is six inches or bigger to grow your herbs in as long as it contains drainage holes. A larger pot provides room for growing roots, which means a bigger plant to harvest from. When you grow herbs indoors they are slightly less productive than plants grown outdoors, but they still provide plenty of flavor for your favorite foods. Basil Not only is basil a tasty addition to your dishes, but having a pot of basil indoors repels flies. Basil is usually added at the last moment as cooking it will quickly destroy the flavor. The best type of basil to use for cooking is Genovese. You can store fresh basil for a small period of time in a plastic bag in the refrigerator or for even longer in the freezer after being blanched. This herb has weaker flavor dried than it does when it is fresh. Chives The chive has a mild onion-like flavor. The ‘Grolau’ chive grows in abundance in windowsill gardening. When harvesting cut the leaves to soil level to keep new ones coming in. Chives can be dry-frozen without harming the taste, which allows the home-grower to store it in large quantities. Rosemary An upright variety of rosemary like the Blue Spire or Tuscan Blue are best for indoor growing. Rosemary needs more sun than some of the others, so make sure you are keeping it in a well-lit place in the house. It is very sensitive to overwatering, but you also don’t want to let the soil completely dry out either, so be careful with it. Fresh rosemary will keep 10-14 days in the refrigerator and four to six months in the freezer. Mint The mint plants can be very invasive so they need to be in their own pots. Peppermint and spearmint are both great indoor choices. Peppermint goes nicely in teas and a little bit of it will go a long way. Thyme Lemon Thyme and French Thyme are good to use in cooking. Thyme plants like six to eight hours of sun everyday so make sure you choose a well-lit location for this herb as well. Fresh thyme is more flavorful than dried, but once picked only has a shelf life of around a week, so it is best to pick as needed. When a recipe calls for a “sprig” or “bunch” of thyme it is referring to the whole form. When is specifies spoons (tablespoons/teaspoons) then it mean only the leaves. You can easily remove the leaves from the stem by scraping them off with the back of a knife or even by pulling through the tines of a fork. Other herbs will do well grown indoors as well. If you follow the planting and growing directions on the plant when you purchase it you should have little to no trouble with your indoor herb garden. For recipes featuring the herbs above, click on “recipes” on the Fill Your Plate home page and then type in the herb you are looking for. Once you do recipes like the Basil Butter Sweet Potato Patties will pop up for your enjoyment. Boil, steam or microwave the sweet potato until it is tender; drain. Mash the sweet potato with butter in a medium bowl; stir in the basil, nuts, garlic, cheese and breadcrumbs; when cool enough to handle, shape the sweet potato mixture into 8 patties. Heat the oil in a large pan, preferably non-stick, and cook the patties in 2 batches, until browned on both sides and heated through; serve with your choice of meats and salad greens. This entry was posted in Gardening, In the Kitchen and tagged Garden, herbs, Home, Kitchen, local food. Bookmark the permalink. Lovely post! My sister wants to make a small herb garden in her kitchen and your suggestions and advises are exactly what she needs. I’m surely recommending your article to her and to some friends too. Thanks for sharing and happy gardening!